We provide our regular subscribers with high level professional analysis & unbiased opinion on property investment. We also offer our readers a wealth of research material in our article archives with links to professional contacts who will help you to build up your property portfolio. 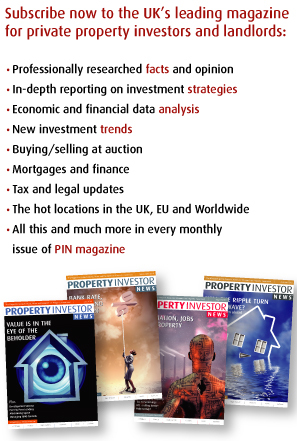 We publish Property Investor News™ magazine every month and it's sent by mail to your home or business address. As a subscriber you gain access to our extensive article archive which has over 12,500 articles which we have published since early 2002 and a growing library of video interviews with industry professionals and investor/landlords. A subscription costs from just £7.95 per month via Direct Debit (charged quarterly at £23.85 for a minimum period of 12 months), alternatively you can pay for the entire year up front for just £109 via a debit or credit card. So don't delay, subscribe now and upon receipt of your payment we will activate your subscription and send you your first copy of Property Investor News™ magazine. To subscribe, please use our on-line payment system below. We accept all major credit & debit cards.